In my speaking and church consulting, I usually point out that we need to fish where the fish are. I’ve heard church boards complain about how nobody new is coming to their church anymore. I’ve seen outreach committees fail to understand why they aren’t being successful. I’ve counseled pastors who feel frustrated that they’re preaching to the choir, and nothing is happening. I’m not all that outdoorsy. I don’t own any fishing gear, but I know this basic truth, you can’t catch any fish if you don’t go fishing. In John 21, the Bible tells the story of seven disciples who go fishing. They’re out all night and get nothing. Jesus is standing on the shore when they get back. They do what Jesus says and they get more fish than they can handle. That’s the story in the Scriptures. We have that, and we know the wisdom in it. So what’s keeping us out of the water? I can’t help imagining their reactions. Do what now? You want us to fish on the right side of the boat? We’re the professionals. We know what we’re doing. We’ve never done it that way before. We’re tired. We don’t wanna. They had been out all night, and they didn’t get any fish. I think it’s safe to assume they were tired. The rest is all my imagination. So many churches function (disfunction) on the 80/20 principle. Eighty-percent of the work is done by twenty-percent of the people. It’s not healthy, but it happens. I had been attending a church for about three weeks. I was having a conversation with someone, when they asked me to take over their ministry. I had expressed previous experience with something similar. I hadn’t said that I liked it, was passionate about it, or that I was successful. I was a warm body, and to that tired body, I was all they needed. When someone is tired, and they hear they need to do something extra, it can feel overwhelming. Ideally, you want to prevent this. You want to spread the work out more, and get more people involved in more ministries and projects. Do you know what trumps tired? Relationships do. Jesus had a relationship with these men. When he asked them to keep going, even though they were tired, they did. Does your church have the kind of deep relationships it takes to spread the responsibilities around, and get beyond the inevitable tiredness? Jesus, you’re a carpenter, what do you know about fishing? We’re the professional fishermen here. I’ve seen egos play out like this and dismiss critical advice, simply because it didn’t come from the right person. I’ve also heard someone suggest that Jesus meant “correct” when he said “right.” I’d like to correct that if I may. The greek word there, translated as “right” is “dexia” (δεξιὰ). It’s our root word for dexterity. The literal words are, “Cast to the right side of the boat the net and you will find.” Since they were on a boat, Jesus was talking about the starboard side. The thing is, people in that day were afraid of the deep water. They stuck close to shore as much as possible, and thought that “The Deep” was the site of the underworld, or Hell. Fishing with a net from a boat was done on the port (left-hand) side so they were not accidentally drawn out into deeper water. 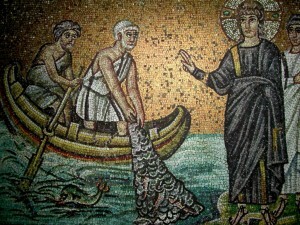 Jesus tells theses seven professional fishermen to cast their nets where it’s dangerous and uncomfortable. They could have easily been patronizing, smiled and nodded. They didn’t. They put their egos on hold, and gave it a try. That’s not easy to do, and it’s often defeated by one of the most dangerous phrases ever uttered in church. That sounds difficult, dangerous, and uncomfortable. I don’t like the sounds of those words, and I’m not ok with those things. Barna research tells us that some 5,000 churches close each year. Two articles, The “Sounds a Church Makes Just Before Dying” by Jim Book, and “Honest Talk about Dying Churches” by David Pace have brought out some of the reasons. What will (group) think about it? That last one there is one of my favorites. It’s fear, plain and simple. It’s a way to say that you don’t want to try anything new, scary, or uncomfortable. Another way to put it is, “We keep trying the same things over and over, and none of those things are working any more.” I’ve heard someone at a church actually say, “We already have all the banners made for what we’ve been doing.” It was as if they couldn’t imagine making more banners, or that ministry had to include banners, or that maybe banners could be part of the problem. Jesus told them to fish where the fish are. He didn’t qualify it with, “if you’re not too tired,” or “if you agree with me,” or “if it’s ok with you.” To reach people, you may need to fish on the other side of the boat, different from the way you’re accustomed. Are you willing to make disciples even if you’re tired, or it seems like you need to do things in a different way? You can’t reach people if you don’t get their attention. You can’t get their attention if they don’t know you exist. They won’t know you exist if you don’t go where they are and just stay home. It’s time to go fishing. Where are those people spending their time and energy now? Where is your church spending its time and energy?